Courtyards are enclosed outdoor spaces but are normally open to the elements at their top. Courtyards don’t belong to one specific period of history. It seems that they have always been around. Below you will find a comprehensive history of courtyards throughout the world. Each country that they have been developed in has showcased a courtyard with at least a slightly different style. The first courtyards date right back to the start of home construction. These courtyards were often used as areas for cooking, as they provided a large space for an open fire and a bigger area for the smoke to escape from. People would also use the areas as sleeping areas, work places, playgrounds and of course as gardens. These courtyards were inspired by the open plan central areas which had often been used as gathering points and cooking areas. Some of the most famous examples of the earliest courtyards in history include The Court of Lions in Andalusia and the Mosque of Uqba in Tunisia’s city of Kairouan. Ur is a Sumerian City, of ancient origin, which was previously sited on the Euphrates River, in the region of Southern Iraq. Towns would have a series of two storey buildings that would be set around an open courtyard in the middle. These courtyards would typically be public spaces that the occupants of the two storey houses could congregate in together. Although we refer to these spaces as courtyards today, in 2000 BC, they were typically referred to as Atriums, a term which also carries a slightly different meaning today. Atriums are now typically seen as large glass roofed and sided structures. The Romans often installed large wells within the centre of the courtyards to catch falling rain water. They also installed beautiful water features there too. These courtyards would be used in the same way they had always been, but would also be used as stages where travelling singers and musicians would expose their talent to those living in the area. These courtyards were laid out in a similar fashion to the Roman courtyards. There would be a square centre to a collection of a number of houses. These houses would often belong to one family. Each relative would occupy a house each. Courtyards would always feature a garden that would promote peaceful thought and tranquillity, and would also have water features as a centre point. Larger ‘estates’ would have numerous courtyards within a vast collection of interlinked houses. Middle Eastern courtyards would often feature marks of the religion they were built around. Wells and water features would be built with incorporated markers of faith on them. This feature highlights how close to the heart of the community that these courtyards became. In Islamic areas, private courtyards were often the only place that Muslim women would be permitted to go alone. During this period, courtyards in Britain were mainly found in Monasteries. They provided a quiet sanctuary for Monks to go about their business. These courtyards didn’t bear any of the marks of the more affluent courtyards of the Middle East or Rome. These were simple areas for reflective thought. Courtyards of this period were characterised by large seating areas. Once again bringing the idea of community to the forefront of their design. These courtyards were no longer available for everyone in a village and were instead reserved to the higher classes who had constructed them within their homes. Everything in the Georgian period was about affluence and wealth. Georgian nobility were very concerned with showcasing their wealthy class status. The introduction of courtyards in Georgian homes was done to allow private areas for guests to talk in. The courtyards often had large water features at their centre and decorated statues all around them too. Beautiful architecture was a big part of Victorian society. Courtyards featured stone pillars that were beautifully carved with cherubs and deities. Gardens were built around these structures too. Hampton Court Palace features some of the most interesting and beautiful walled gardens in the UK. Within the walls of these courtyards, Queen Victoria’s children and grandchildren learned to garden and appreciate the quiet beauty of nature. To this day it remains one of the most architecturally beautiful places that you can visit in the whole of the UK. Courtyards built in the twentieth century generally took much inspiration from courtyards of the past. During this time, the American Davis and Zwebell families designed numerous homes that were based on Mediterranean courtyards. These homes were particularly popular in the affluent suburbs of Los Angeles. Many of the century’s early starlets had homes designed by either one of the families. The design of these courtyards then spread further across North America. Some of the homes even featured on popular American TV shows like Melrose Place and Dynasty. These homes weren’t within reach of the lower classes. Courtyards often feature now in modern open plan homes and public buildings. Many upmarket restaurants and bars have been built around courtyards, because they produce a calming and relaxed atmosphere. However, you are most likely to find them outside rather than within buildings. The latest trend with these structures is to have them outside of the home as private gardens. These gardens are extremely popular as they can be created in many different areas. Structures are very similar to atriums or patio gardens, but always have enclosed walls that either encircle your whole home or are just attached onto the back or side of your home. 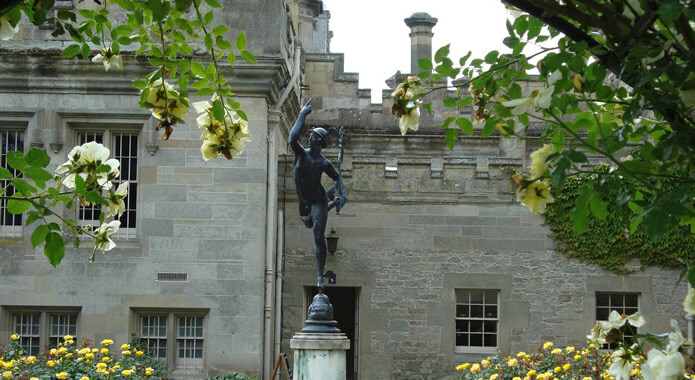 Historically, many grand estates had courtyards within their home as well as courtyard gardens within their grounds. Some ruined stately homes have even been restored as courtyard gardens, which is a wonderful way to restore homes which once housed them inside the building. The sense of community that courtyards can provide must be the reason why they still fascinate designers and property developers alike. Courtyards are ultimately timeless, because they have been a permanent fixture in our civilisation.